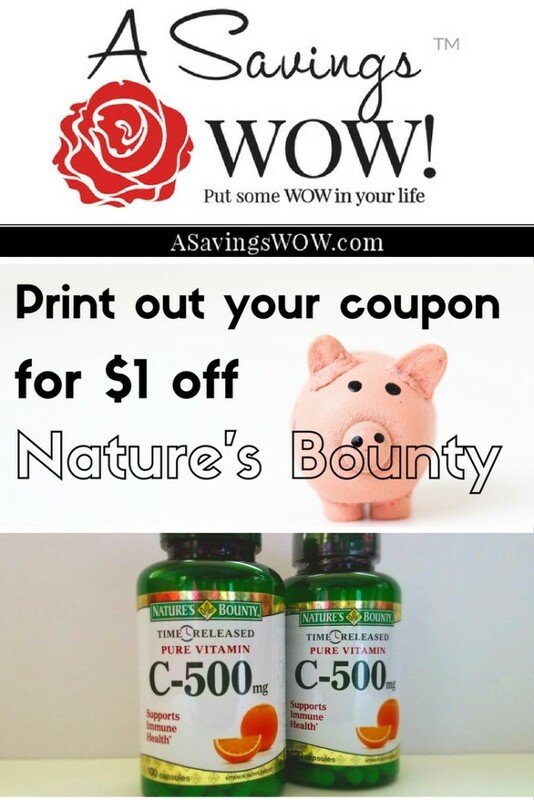 Nature's Bounty Coupon | A Savings WOW! Like many households, we are a busy family with many things to do and places to be, so when one of us gets sick, it affects everyone. With four kids in our house, even the common cold can spread quickly and stop us in our tracks. For moms and dads who have to get the kids to and from their different activities, it’s especially important to stay healthy. One way we keep our family healthy is by using Nature’s Bounty vitamins and supplements. Even though it’s currently summertime, it doesn’t mean that we don’t get colds. We like to use Nature’s Bounty Time-Released Vitamin C to supplement our diet and help keep colds at bay. As a woman in her mid-40s, I also love that Nature’s Bounty has a line of products to help a with healthy aging process. Some of the Nature’s Bounty Optimal Solutions products include Ageless Eye, Healthy Hair and Radiant Skin. By using these supplements, I’m hoping my body will look and feel as young as I am at heart. This week, Walgreens and CVS have buy one, get one free deals on select Nature’s Bounty products. Print out and use two of the coupons above to save even more money!